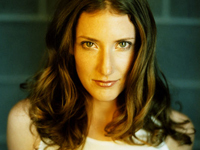 Kathleen Edwards was born in Ottawa, Canada, in 1979, the daughter of foreign service parents who played piano and guitar in their spare time. At five, Edwards began to study classical violin, which continued through her early teens. At that point, the Edwards family moved overseas. Removed from the influence of mainstream North American pop music, Edwards delved into her older brother’s collection of Bob Dylan, Neil Young, and early Tom Petty records. After high school, Edwards landed back in Ottawa, singing and playing her guitar in local clubs and networking with other musicians in the scene.